1. Place a muffin ring in the middle of a plate them arrange the packaged salad around it. 2. Make some roses with thin ham slices. 3. Cut out cheese to make star shapes. 4. 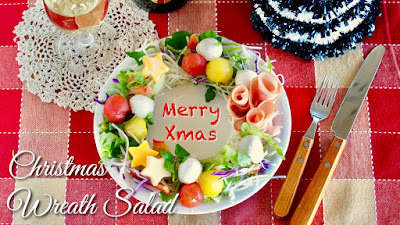 Decorate the salad, remove the muffin ring, then eat with your favorite dressing. 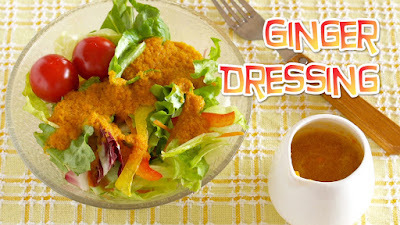 Very filling and healthy dressing :) Also called Carrot Ginger Dressing. 1. Place all ingredients in a blender and process until smooth. You can keep it in the fridge for about a week but best used as soon as possible. 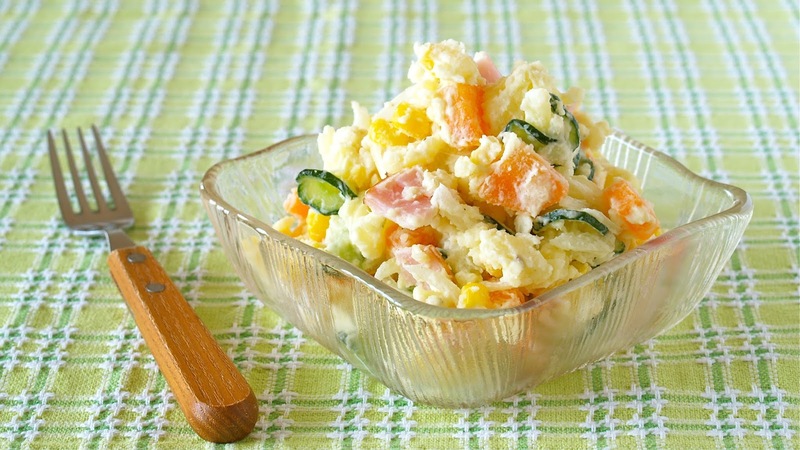 A luxurious, sparkling Christmas avocado and potato salad with salmon, corn, and cream cheese. 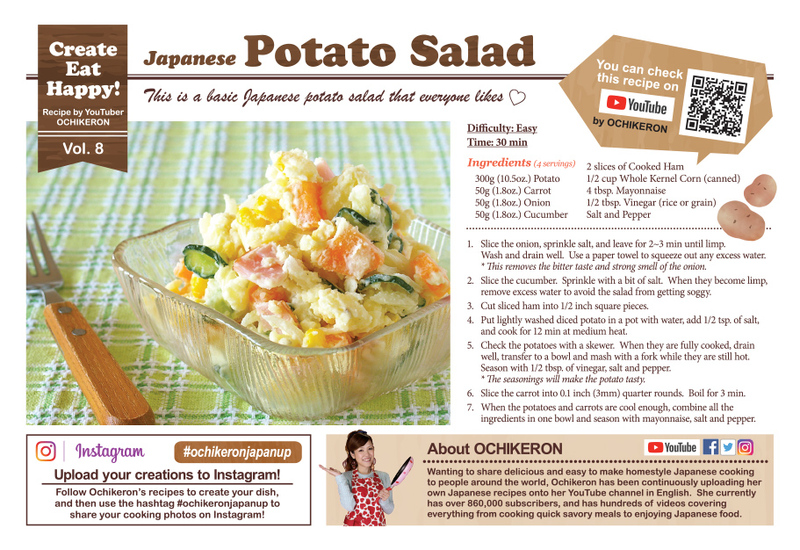 Avocado added to the potato brings out the richness and makes it an easy-to-eat salad! It's nice as a sandwich spread, too. 1. Thinly cut the potatoes, put the slices in a microwavable dish, wrap with plastic wrap, and microwave at 500W for about 5 minutes until soft. 2. Mash the potatoes and avocado together while still hot (heating avocado will prevent it from changing color). Add A and mix well until creamy. 3. Add the finely chopped smoked salmon, cream cheese, sweet corn, and parsley flakes, then mix. 4. 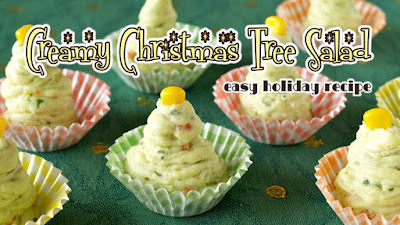 Put the mixture into a pastry bag and pipe out into Bento cups in cone shapes so they look like Christmas trees. Top with gold powder or a whole corn kernel. You can of course arrange it in the way you want. I hope you get an idea from this video!!! 1. Layer all ingredients from bottom to top. 2. Shake to eat ;) You can serve on a plate if you like. 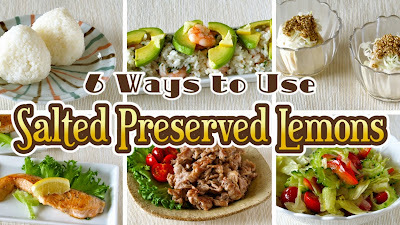 In this video, I will show you 6 ideas to use a jar of Salted Preserved Lemons! You can use as a lemon wedge, use the liquid (juice), and/or use as salted lemon peel. ENJOY! 1. Instead of using water, wet your hands with a bit of salted preserved lemon juice so that the rice won't stick. 2. Place about 100g of rice on your hand. Form the rice into a triangle by pressing lightly with your palms. 1. Mix the sauce (A) very well. 2. 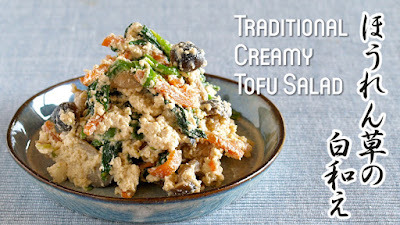 Drain and serve the Tofu on a dish. 3. Place chopped long or green onions and pour over the sauce. 1. 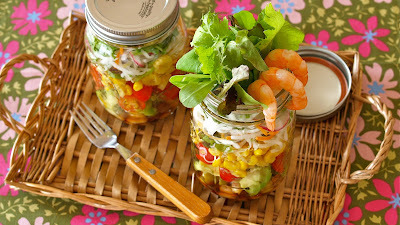 Put A in a container or a jar with a lid and shake to mix. 2. 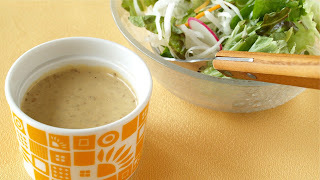 Toss the salad of your choice with the dressing (1.). 1. Mix A very well. 2. Place cooked Japanese rice in a bowl. Add (1.) while the rice is hot and slice through rice using rice paddle to separate the grains. 3. Add cooked shrimp, sliced Shiso leaves, and toasted white sesame seeds, then mix well. 5. Serve the sushi rice on a dish, place the sliced avocado, then garnish with chopped peel if you like. 1. Season the pork with A. 2. Stir-fry the pork in a frying pan until done. 1. 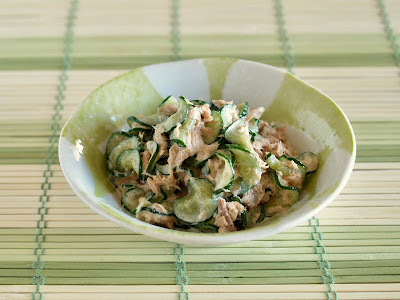 Season the salmon fillets with A. 2. Heat olive oil in a frying pan. Then place the fillets, cover, and cook about 2 minutes on each side until golden brown. 3. Serve on a dish with a lemon wedge. 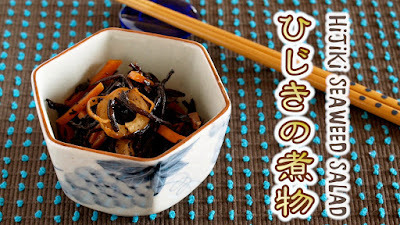 Umeboshi (pickled plum) and olive oil makes the dressing very tasty but refreshing. 2. Thinly slice lettuce. Cut tomato in half then slice. 3. In a boiling water, put the pork slices and cook until no longer pink. Then drain well with a strainer. 4. 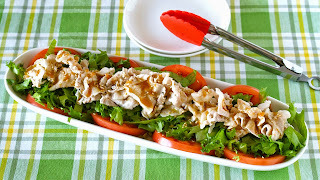 Place the tomatoes and lettuce in a dish, put the pork on top, pour the dressing (1.) over the pork, then sprinkle with toasted white sesame seeds to finish. The bitter taste of watercress and the spicy flavor of Wasabi matches very well!!! 1. Mix A in a bowl. 2. Wash watercress in cold water and drain well. Separate stalks and leaves. Bring a pot of water to a boil. Cook the stalks for a few seconds, then add the leaves and cook for another few seconds. Soak in cold water and drain well with paper towels. 3. 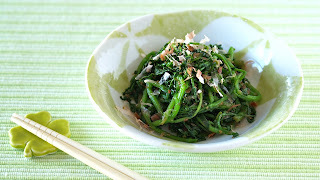 Put the watercress and Katsuobushi in the bowl (1.) and toss lightly. 1. Please use freshly ground toasted white sesame seeds to make it flavorous. *You can serve it with vegetable sticks as a dip. 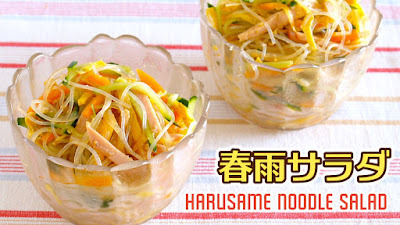 *If you think the texture is too thick to dress a salad, you can add a bit of water (or dashi stock) to loosen up the texture. *You can use unsweetened plain yogurt instead of mayonnaise. It will taste different but still good! Yukari (ゆかり) is a very popular Japanese red Shiso leaves (red perilla) rice seasoning. I know that Yukari sounds like a Japanese girl's name but this Yukari is from Kokinwakashu (古今和歌集: a collection of Waka poems in old times). Yukari is named after one purple plant that means "fate" or "something you feel familiar to" in Kokinwakashu. 1. Cut off both ends of a cucumber. Partially strip the cucumber skin with a peeler (it makes it look good & lets the seasoning absorb). Place plastic wrap over the cucumber and break it into bite-size chunks using a rolling pin. 2. 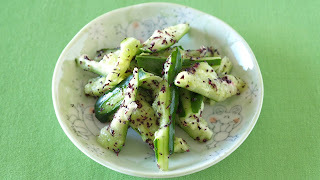 Tear the cucumber into nice bite-size pieces. Sprinkle with Yukari and toss lightly.